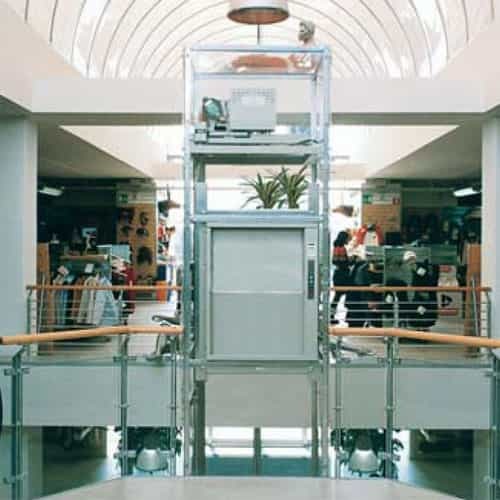 SOMETIMES CALLED A MICRO LIFT, A SMALL SERVICE LIFT, A FOOD LIFT OR A KITCHEN LIFT, DUMBWAITER LIFTS ARE IDEAL FOR TRANSPORTING FOOD AND DRINK BETWEEN LOCATIONS OR FLOORS IN A RESTAURANT, BAR OR PUB. These small lifts are perfect for the repeated movement of small loads in a range of other businesses too. 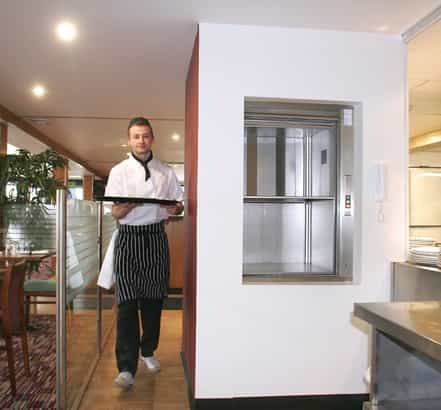 At Axess 2 we provide a broad range of dumbwaiter lifts that are suitable for use within a range of situations. 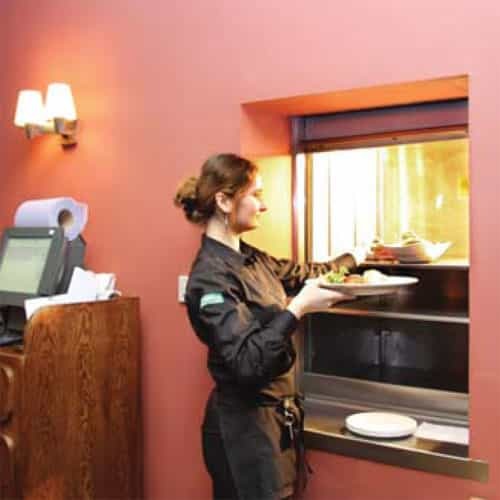 Whether you are looking for a dumbwaiter to transport food efficiently between the kitchen and dining areas in a restaurant, or are seeking a home installation to assist a disabled person, our proven service for dumbwaiter lifts can ensure that your requirements are fully met at all times. A dumbwaiter is also of value in numerous other environments which may not immediately spring to mind. For example, they can be used for transporting goods in a shop, moving stationery between office floors, or relocating records in a medical centre or hospital. Because of this flexibility, dumbwaiters typically prove to be a great assistance to any sort of business environment. Dumbwaiters were first invented in the 19th century, although the original meaning of the phrase actually indicated a device that was more akin to a serving tray. Nonetheless, the new meaning soon became the exclusively accepted definition, and the success of dumbwaiter lifts is clearly evident from the fact that they still see such widespread use today. 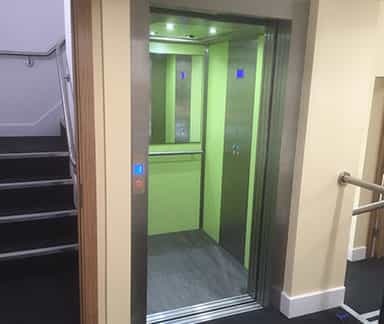 Our reliable selection of varying lifts have already been utilised within some of the UK’s most prestigious establishments, so you can always be certain of receiving the very best quality service when you choose Axess 2. For more information, please get in touch with our professional team now and we will be pleased to help meet your dumbwaiter needs. The 50kg dumb waiter lift is ideal for small catering premises, pubs and restaurants, offices and private homes. The 100kg capacity service lift is ideal for busy catering environments, pubs, clubs and restaurants and industrial applications. Two standard lift car sizes are offered, in either dumbwaiter form with counter serving rise and fall shutters, or service lift form with floor level serving hinged doors. This dumb waiter lift is a dumb waiter designed for premises with restricted headroom. The motor unit is located on the side of the shaft thus offering reduced headroom. Loading and serving is from a counter level entrance with rise and fall shutters, or from a floor level entrance with hinged doors and a suitable pit. An alternate option to those with restricted headroom, the motor unit is located at the bottom of the shaft giving reduced headroom and easier maintenance access. Loading and serving is from a counter level entrance with rise and fall shutters. The Double Decker dumb waiter service lift utilises two lift cars in the same shaft, ideal where space is restricted. Loading and serving is at both floor and counter levels. The lower car entrance has a hinged landing gate, the upper car has rise and fall shutters. Dumb waiter lifts have a self-supporting galvanised structure. 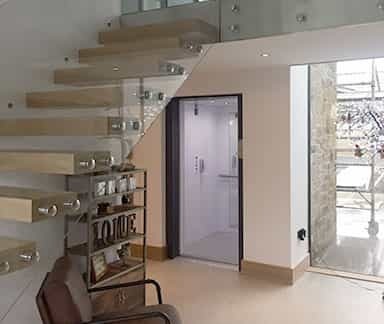 It doesn’t require a load-bearing lift shaft or separate motor room. 415 Volt-3 phase-50Hz or 240 Volt-1 phase-50Hz. A 15 amp isolator should be supplied for the lift by others. Automatic push button control, with call and despatch facilities at each landing entrance. Lift position, lift status and audible indicators are standard on the lift. A two floor Dumb Waiter Lift should take approx 1-2 days to install. Site conditions can affect the install time. Axess 2 recommends the Dumb Waiter Lift is inspected and serviced every 3 months by the lift installers. This is to maintain efficient and reliable operation. Our dumb waiter lifts are guaranteed for twelve months from completion of installation, subject to it being serviced regularly.